Exchange Online has a limit of 10,000 folders within a mailbox. If you try and migrate a mailbox with more than this number of folders then it will fail – and that would be expected. But what happens if you have a mailbox with less than this number and it still fails for this reason? This is the problem, with resolution, I outline below. ​​​​​​​​​​​​​​​​​​​​​​​​​​​​​​​​​​​​​​​​​​​​​​​​​​​​​​​​​​​​​​​​​​​​​​​​​​​​​​​​​​​​​​​​​​​​​​​​​​​​​​​​​​​​​​​​​​​​​​​​​​​​​​​​​​​​​​​​​​​​​​​​​​​​​​​​​​​​​​​​​​​​​​​​​​​​​​​​​​​​​​​​​​​​​​​​​​​​​​​​​​​​​​​​​​​​​​​​​​​​​​​​​​​​​​​​​​​​​​​​​​​​​​​​​​​​​​​​26/03/2019 17:10:09 [VI1PR0502MB3855] ‘MigrationService (on behalf of ‘Brian.Reid@domain.co.uk’)’ created move request. 26/03/2019 17:10:15 [DB8PR05MB6025] The Microsoft Exchange Mailbox Replication service ‘DB8PR05MB6025.eurprd05.prod.outlook.com’ (15.20.1730.17 ServerCaps:01FFFFFF, ProxyCaps:07FFFFC7FD6DFDBF5FFFFFCB07EFFF, MailboxCaps:, legacyCaps:01FFFFFF) is examining the request. 26/03/2019 17:10:15 [DB8PR05MB6025] Content from the Shard mailbox (Mailbox Guid: f12f3e45-67aa-89012-345f-ce678efea901, Database: cc980daf-4402-4645-b26c-2a83760b161c) will be merged into the target mailbox. 26/03/2019 17:10:15 [DB8PR05MB6025] Connected to target mailbox ‘tenant.onmicrosoft.com\2c065e32-3bd5-4524-9aac-03880fa8e961 (Primary)’, database ‘EURPR05DG090-db014’, Mailbox server ‘DB8PR05MB6025.eurprd05.prod.outlook.com’ Version 15.20 (Build 1730.0). 26/03/2019 17:10:20 [DB8PR05MB6025] Connected to source mailbox ‘tenant.onmicrosoft.com\2c065e32-3bd5-4524-9aac-03880fa8e961 (Primary)’, database ‘DB’, Mailbox server ‘onprem.server.domain.com’ Version 15.0 (Build 847.0), proxy server ‘onprem.server.domain.com’ 15.0.847.40 ServerCaps:, ProxyCaps:, MailboxCaps:, legacyCaps:1FFFCB07FFFF. 26/03/2019 17:10:21 [DB8PR05MB6025] Request processing started. 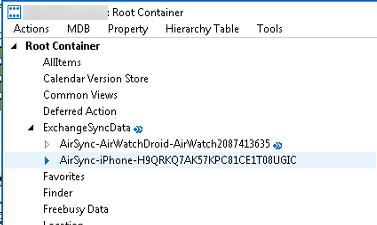 26/03/2019 17:10:21 [DB8PR05MB6025] Cleared sync state for request 2c065e32-3bd5-4524-9aac-03880fa8e961 due to ‘CleanupOrphanedMailbox’. 26/03/2019 17:10:21 [DB8PR05MB6025] Mailbox signature will not be preserved for mailbox ‘tenant.onmicrosoft.com\f12f3e45-67aa-89012-345f-ce678efea901 (Primary)’. Outlook clients will need to restart to access the moved mailbox. 26/03/2019 17:11:20 [DB8PR05MB6025] Stage: CreatingFolderHierarchy. Percent complete: 10. 26/03/2019 17:12:38 [DB8PR05MB6025] Initializing folder hierarchy from mailbox ‘tenant.onmicrosoft.com\2c065e32-3bd5-4524-9aac-03880fa8e961 (Primary)’: 29048 folders total. 26/03/2019 17:21:21 [DB8PR05MB6025] Folder creation progress: 1102 folders created in mailbox ‘tenant.onmicrosoft.com\2c065e32-3bd5-4524-9aac-03880fa8e961 (Primary)’. 26/03/2019 17:31:22 [DB8PR05MB6025] Folder creation progress: 2730 folders created in mailbox ‘tenant.onmicrosoft.com\2c065e32-3bd5-4524-9aac-03880fa8e961 (Primary)’. 26/03/2019 17:41:22 [DB8PR05MB6025] Folder creation progress: 4535 folders created in mailbox ‘tenant.onmicrosoft.com\2c065e32-3bd5-4524-9aac-03880fa8e961 (Primary)’. 26/03/2019 17:51:23 [DB8PR05MB6025] Folder creation progress: 6257 folders created in mailbox ‘tenant.onmicrosoft.com\2c065e32-3bd5-4524-9aac-03880fa8e961 (Primary)’. 26/03/2019 18:01:23 [DB8PR05MB6025] Folder creation progress: 7919 folders created in mailbox ‘tenant.onmicrosoft.com\2c065e32-3bd5-4524-9aac-03880fa8e961 (Primary)’. 26/03/2019 18:11:23 [DB8PR05MB6025] Folder creation progress: 9570 folders created in mailbox ‘tenant.onmicrosoft.com\2c065e32-3bd5-4524-9aac-03880fa8e961 (Primary)’. The move request logs show an increasing folder count, and when this exceeds 10,000 a storage error occurs. So the next thing to do is to check what I have on-premises. I have generally two options to try and fix a mailbox I am moving to Exchange Online. One is to move the mailbox elsewhere on-premises (on the basis that I discard errors on-premises and then move a cleaner mailbox to the cloud) or run repairs on the mailbox. Note that running repairs on-premises is part of the move to the cloud anyway as Exchange Server does this as part of the move. But this revealed nothing! The move request logs on-premises showed the same – there was over 10,000 folders (indeed some of my mailboxes had over 20,000 folders) and this was enumerated in the move request logs. A New-MailboxRepairRequest did nothing either. But interestingly, Get-MailboxFolderStatistics | Measure showed only 200 folders! Each of my failing mailboxes had between 150 and 263 folders – nothing like the +10,000 that the move request was finding! So I opened the mailbox in Outlook having granted myself permissions to it – again nothing. So I opened MFCMapi and had a look at the folders. Now MFCMapi shows everything in the mailbox, and not just items under the “top of the information store” folder. I went about expanding each subfolder I could find and I came across a subfolder that everytime i expanded it, MFCMapi would hang. I would close and restart MFCMapi and the same thing! I had found my suspect folder – its a iPhone device that had created the +10,000 folders. Now that I had a good candidate for my issue, the fix was easy. I listed the active-sync devices using Get-MobileDevice -Mailbox “Richard Redmond” | FL Identity and then removed the suspect device using Remove-ActiveSyncDevice “domain.co.uk/OU/Richard Redmond/ExchangeActiveSyncDevices/iPhone§A9BCDE7FG57HIJ81KL1M08NOPQ” -Confirm:$false where the device identity was returned in the Get-MobileDevice cmdlet run just before. This Remove-ActiveSyncDevice (or Remove-MobileDevice) cleans up this mailbox and deletes the partnership with the device. Once this was done, I moved the mailbox again and it was ~200 folders and moved without further issue. From the users perspective, if the phone is an active device and is syncing email, then removing the phone causes it to create a new partnership. If the server allows any device then this is seamless to the user. If the server requires authorization to add a new device, then the user will be told this and you need to approve it again. So if Allow/Block/Quarantine (ABQ) is not enabled on the server, one wonders if deleting all active sync partnerships before migrating any mailbox is an idea worth considering – there could be mailboxes I have moved that are <10,000 folders but not far from that number.